The students involved could get serious charges against them. Officials said that having drugs is one matter, but distributing them in a drug-free zone could mean felony charges for those involved. 3. Was there a bake-off contest between the top vote-getters? 1. Just being around someone using marijuana, or any other drug, is an offense. It is a misdemeanor known as "frequenting" a place where illegal drugs are being used. 2. Possessing a small amount of marijuana for your own personal use is a misdemenor. I almost laugh when people from out of state show Idaho State Troopers their "medical marijuana" cards in an effort to have charges against them dropped. These cards do nothing except tip off law enforcement that the car in question probably has drugs in it. 3. Possessing things that help you use, weigh, hide or package marijuana (or any other drug) is a crime, known as "possession of drug paraphernalia." It is a misdemeanor. However, possessing packaging and weighing materials often leads to the conclusion that the possessor is involved in the sale or distribution of marijuana, which is a felony. 4. Baking marijuana into cookies or brownies or gummy bears or whatever (known as "edibles") is a felony if done for the purpose of distributing these items to others, whether for free or for sale. 5. Whether mere possession of marijuana is a misdemeanor or felony depends upon the amount of marijuana possessed. Possessing a warehouse full of tons of marijuana is presumably not for personal consumption, but rather distribution. In Idaho, possession of 3 ounces of marijuana is a felony, punishable by up to 5 years in prison and a $10,000 fine. Selling any amount of marijuana is a felony, punishable by up to 5 years in prison and a $15,000 fine. Possessing one pound or more of marijuana constitutes trafficking in the drug, which carries a mandatory minimum prison sentence of one year; possessing 25 pounds of weed gets you a mandatory minimum of 5 years in prison and a fine. Our weed-eating homecoming queen could potentially face a question whether adding ingredients to the marijuana possessed can result in an increased penalty. The answer is "maybe." If someone possessing cocaine adds a pound of flour to the cocaine to make it appear to be a larger quantity of the drug, the person caught with that adulterated coke will be subject to the penalty for possessing the amount of coke he initially had, plus another pound of cocaine. Mixing flour into a controlled substance, for the purpose of getting a better sale price for the larger volume, will result in a higher penalty. A quick review of some of the "marijuana edible" cases in the federal court system appears to confirm that marijuana edibles seized in a marijuana bust are weighed just as a bag of marijuana would be weighed. 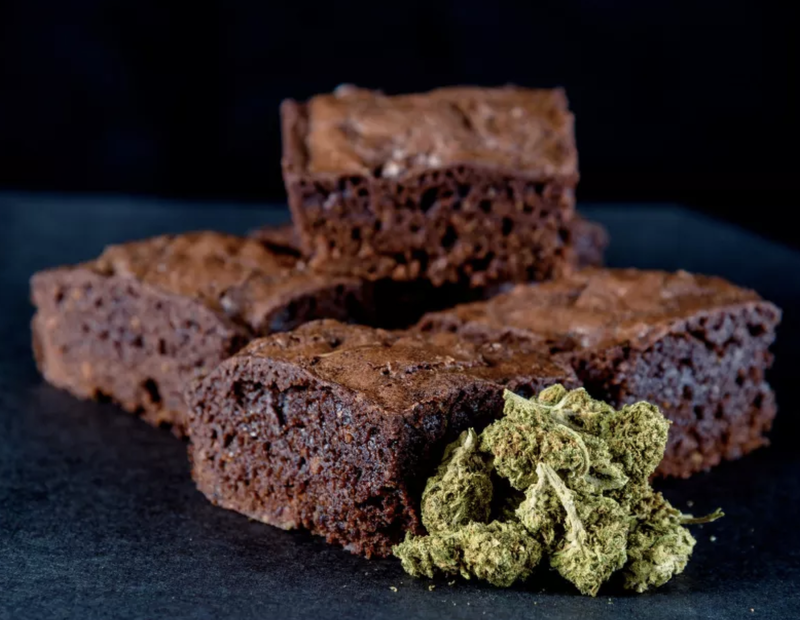 That means the small amount of marijuana in the brownies may not save the baker of Alice B. Toklas brownies if the weight of the brownies exceeds a trafficking amount. As the availability of edible marijuana products expands, it won't be long before an Idaho court has to address this issue head-on: is an edible marijuana product treated the same as a bag of marijuana weighing the same amount? I suspect there is not more information available on this issue in Idaho at this time because most of these cases are going to be resolved via plea agreements, without regard to weighing the brownies.